Do you want to learn more about home food preservation? Need and want to know more than just how to preserve your jam? Are you leery of some of the canning instructions on the web? Can you volunteer to teach or help with classes to teach the public safe, effective, USDA approved home canning techniques and recipes? 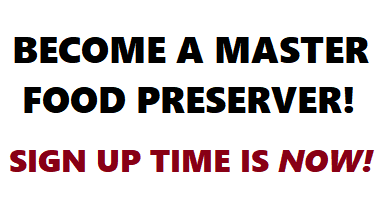 Please go to this link: San Bernardino County Master Food Preservers and then click on "Master Food Preserver Application 2019" above Uncle Sam's Picture for more information!